Swedish Dental Supplies is a manufacturing family business, providing dental products of own design and production to distributors and importers world wide since 1966. Swedent Articulating Paper – 65 µ double check, available in three shapes, i.e. horseshoe, straight or curved. Swedent Polycarbonate Crowns – flexible and thin crowns with excellent cervical fit, precise anatomy and shade stability, available in assortment boxes with or without mould guides, refill boxes and in bulk package. Swedent Rubber Dam – thin, medium or heavy in dark, light or green colour, ready cut or rolls, vacuum packed for prolonged shelf life (best-by-date on each package to guarantee its freshness). Swedent Screw Posts – Gold plated or Titanium. In 20 sizes and 4 length. Available in assortment boxes and refill boxes. Our medical devices comply with the regulatory requirements of MDD 93/42/EEC and our class II a devices are certified in accordance with Annex V of this directive. 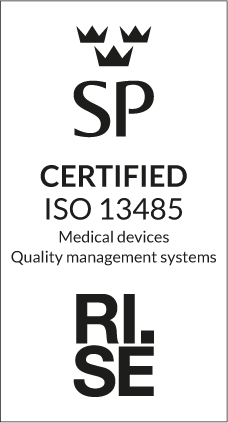 Our quality management system, first certified in 2001, complies with the requirements of ISO 13485.